Tags: A-line, Shirt, Straight Trouser, Thread Embroidery, White. Top: White pure crinkle chiffon Aline shirt has been adorned with embroidered neckline. Beautiful embroidered motifs has been implemented on sleeves. Embroidered border has been embellished on the cuff of sleeves. Fully lined shirt. Concealed with back zip closure. 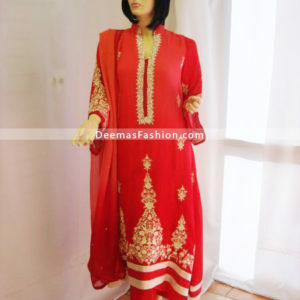 Embellishment includes stones, pearls, kora, sequins, tilla, beads thread work.